Charlie Gard's parents Connie Yates and Chris Gard. 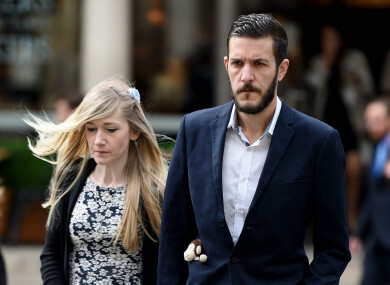 THE PARENTS OF terminally-ill infant Charlie Gard have described as “disgraceful” the death threats which have been sent to staff at Great Ormond Street Hospital. Both Gard’s parents and medics have now received a backlash online as today the UK High Court will analyse the evidence of the case so far. The 11-month-old baby suffers from a rare genetic condition and is on life support but his parents have been locked in a legal battle with the hospital about his care. The parents are fighting to see their baby avail of an experimental treatment in the US but specialists say it will not help and may cause him pain. The judge in the case has instructed that he intends to make a decision on the case on Tuesday. However, he added that he may need more time. Charlie’s mother Connie Yates said she was shocked to hear that staff at the hospital were targeted. She told Sky News: “Despite conflicting issues, we have always had the utmost respect for all the staff who work tirelessly at Great Ormond Street Hospital and the very difficult jobs they do every day. Family spokeswoman Alison Smith-Squire added it was “time everyone refrains from making threats and nasty remarks to either the family or the hospital”. In statement over the weekend, Great Ormond Street said its doctors have received death threats. “Charlie Gard’s case is a heart-breaking one. We fully understand that there is intense public interest, and that emotions run high,” the hospital said. However, in recent weeks the GOSH community has been subjected to a shocking and disgraceful tide of hostility and disturbance. Staff have received abuse both in the street and online. Thousands of abusive messages have been sent to doctors and nurses whose life’s work is to care for sick children. Many of these messages are menacing, including death threats. Families have been harassed and discomforted while visiting their children, and we have received complaints of unacceptable behaviour even within the hospital itself. Email “Charlie Gard's parents condemn death threats sent to hospital staff”. Feedback on “Charlie Gard's parents condemn death threats sent to hospital staff”.